San Francisco (Spanish for Saint Francis) was founded on June 29, 1776, when colonists from Spain established Presidio of San Francisco at the Golden Gate and Mission San Francisco de Asís named for St. Francis of Assisi several miles away. 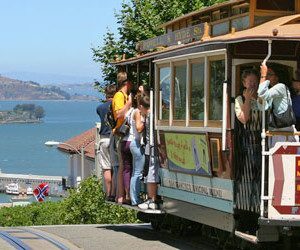 It is known for its cool summers, fog, steep rolling hills, and landmarks including the Golden Gate Bridge, cable cars, the former Alcatraz Federal Penitentiary, and its Chinatown district. With nicknames such as “The City by the Bay”, “Fog City”, “Frisco”, and “San Fran” as well as antiquated ones like “The City that Knows How,” “Baghdad by the Bay,” and “The Paris of the West”, San Francisco will keep you fascinated as you explore all it has to offer.